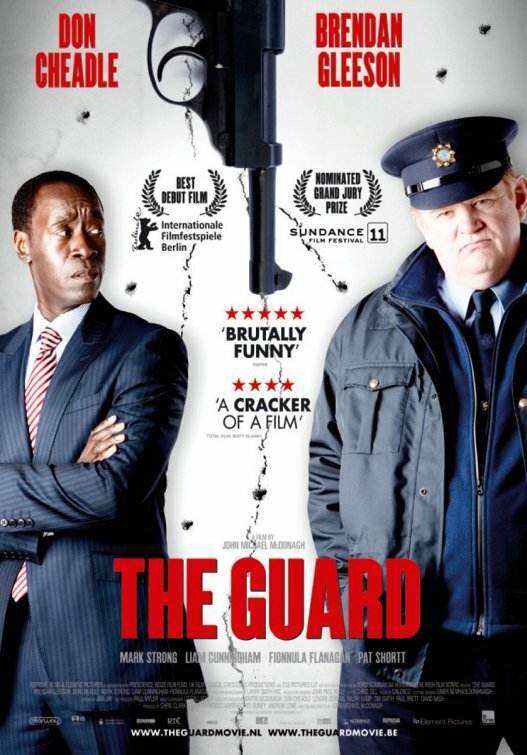 For fans of Brendan Gleeson, one of the best character actors around, a starring role in the profane dark Irish comedy, The Guard, is a starring role long overdue. The man plays an eccentric, self-destructive lawman that follows his own sets of rules and decorum: “Racist? I’m Irish. Racism is part of our culture.” Gleeson’s character gets teamed up with Don Cheadle’s Yankee FBI agent, and for a while it looks like the film might drown in fish-out-of-water gags. Writer/director John Michael McDonagh has a gifted wordsmith’s flourish with words. It may take some concentration to decipher through the thick Irish brogues, but there is a love of language and the witty, looping dialogue is almost musical in its sublime composition. His characters are pretty interesting too. The villains, a band of drug-runners, are introduced arguing philosophy, proving to be the most cultured big screen tough guys since Pulp Fiction. The hyper-literate stock roles trade plenty of insults, which had me regularly laughing. The characters do have a habit of feeling like they know they exist in a movie, so everything, even a man’s final moments, never seems to be that pressing. I just wish these richly drawn characters had a better movie plot to work with. There are too many subplots that don’t seem to reconnect to the main storyline. The Guard seems to lose its way in the middle of too many comic vignettes before going all serious action in climax, much like the similarly flavored In Bruges (written and directed by McDonagh’s brother). The movie feels like a first draft instead of a finished product, though for Gleeson fans, this will be worthy enough. Posted on September 14, 2011, in 2011 Movies and tagged brendan gleeson, comedy, cops, dark. Bookmark the permalink. Leave a comment.